We’ve been hearing this a bit and it’s getting on my nerves. If someone tells you they have ‘trapped a nerve’ they are more than likely wrong. If you have been told you have ‘trapped a nerve’ by someone who has any form of medical training then they are (probably) wrong and (probably) incompetent. In the years that I have been treating patients I have never had reason to tell someone that they have ‘trapped a nerve’ because it is really rare. Also, if they had, they would really know about it. Can I trap a nerve? No – Oh, all right then, you can. So, the classic example is the compression put onto the nerves running through your wrist in carpel tunnel syndrome. This is where the connective tissue thickens and causes the nerve ‘downstream’ of the compressed area to go wrong. This leads to pain and or numbness. You can also do it by getting a disc to prolapse or bulge which can also put pressure on a nerve. 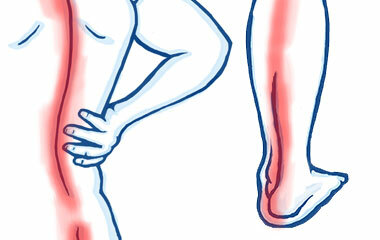 In really extreme cases you can also get arthritic changes that can compress a nerve. The key thing about these is that they are really painful. The pain is long lasting, it tends not to change during the day or night and leads to changes down the nerve as it starts to fail. This could be shooting or electric shock sensations down the arm or leg. You’d also expect to see numbness and pins and needles down the route of the nerve. Oh, and it’d be really painful – have I mentioned that? What is it then of not a trapped nerve then? If it is in your back, then you most likely have an injury called a ‘posterior facet syndrome’. What’s that great sounding thing? Have a look here. Get ice on it first of all. How? Like this. And than come and see us. We are really good with these things. And tell no one it’s a trapped nerve ever again.